The Montreal-based pulp and paper company Resolute Forest Products has been harassed by the American radical environmental group ForestEthics for years. The ENGO (environmental non-governmental organization) has been using threats, intimidation, false accusations, and harassing Resolute’s customers, to disrupt the company’s operations. (It has 19 pulp and paper mills in Canada, the U.S. and Asia). But this story doesn’t have the usual ending of the company caving in to the NGO’s demands and curtailing operations and profits to appease its attacker. Five years ago, ForestEthics and other radical ENGOs concocted the Canadian Boreal Forest Agreement (CBFA): the ENGOs would stop boycotting Canadian forestry companies who in return would suspend logging on almost 29 million hectares (over 70 million acres) of boreal forests across the country. The Canadian Forest Products Association got its 18 members, including Resolute, to sign the agreement. A few weeks ago, ForestEthics’ executive director, Todd Paglia, sent a warning letter to Richard Garneau, Resolute’s CEO. Paglia accused Resolute for “refusing to co-operate” and therefore dismissed the company from the CBFA, effectively ending the five-year cease-fire between the ENGO and the company. This is exactly the response that a business under an attack needs to give: stand your ground and call out the attacker’s unethical conduct. When you know you are right and your accuser wrong, the right response is to claim the moral high ground and refute the false accusations. But therein is the catch: many business leaders want to avoid conflict at all costs, believing that compromising is the best solution. They don’t realize that a compromise between opposite principles always harms the good side, those acting on valid principles, and benefits the evil side, those brandishing destructive ideas. (Signing the CFBA was such a compromise, although likely motivated by the companies’ desire to end the continual harassment by the ENGOs). Business leaders lack the courage and conviction to stand up to their attackers for two main reasons. First, they share their attackers’ view that business should sacrifice profits for the sake of others’ needs, such as the environmentalists’ need to curtail human prosperity and flourishing (disguised as the protection of pristine forests and caribou habitats). Second, many business leaders fail to grasp the value of acting on (valid) principles and the hazard of compromising them. 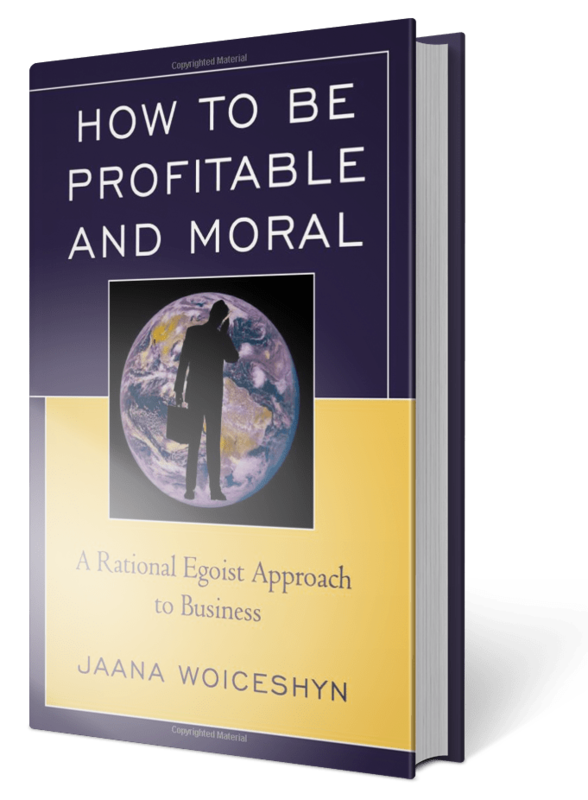 The compromising business leaders fail to understand is that business is a moral endeavor and a force for good that deserves to claim the moral high ground. Business firms create the material values, the goods and services that our lives and well-being depend on. Profit is their deserved incentive and reward, which firms can only earn when they trade their products with those who consider them valuable. The principle is trade—of value for value, by mutual consent for mutual benefit, respecting each other’s individual rights. There is no moral duty to sacrifice profits for the needs of others. Acting on principle—with integrity—is also essential for long-term profitability. Humans are fallible, without automatic knowledge of the right goals and the means to achieve them. We need guidelines that help project the future and choose concrete actions that lead us to distant goals. Principles are such guidelines. The principle of trade and the principle of individual rights, as identified by Ayn Rand, are good examples of guidelines in business. They highlight the importance of trading values (each party having something to offer, which requires production) for mutual benefit (one party not exploiting the other—no violation of individual rights by force), by mutual consent (no deception or fraud—no violation of rights). Richard Garneau is not a typical business leader. Having learned that compromising with attackers of business such as ForestEthics only leads to continued bullying, he stood up against them. The consequence? ForestEthics’ Paglia backed out, responding with an acknowledgement of Resolute’s good work and a promise to work on “win-win” solutions. Bullies, from eco-warriors to terrorists, don’t want their victims to stand up and defend themselves. This is what business under an attack must do, to continue producing material values for long-term profit. Previous articlePragmatism is impractical—why does it rule in business? Is that just a pressure tactic or extortion (which is illegal)? “fear” and “threat” seem to apply here. Note the collectivist shame attempt in a letter to Resolute – the “you are the only one…” scam. A sidebar on the article gives information on the ENGO’s funding. Thanks, Keith, for your comment and sharing the link. I would argue it’s extortion.